Deckawoo Drive's intrepid animal control officer meets her match -- or does she? A funny, heartfelt, and fast-paced romp from Kate DiCamillo. Francine Poulet is the greatest animal control officer in Gizzford County. She hails from a long line of animal control officers. She's battled snakes, outwitted squirrels, and stared down a bear. "The genuine article," Francine's dad always called her. 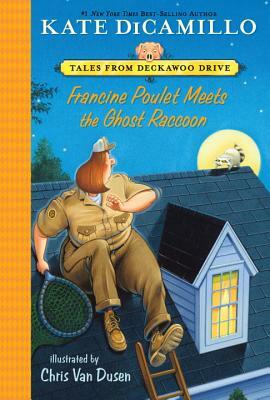 She is never scared -- until, that is, she's faced with a screaming raccoon that may or may not be a ghost. Maybe Francine isn't cut out to be an animal control officer after all! But the raccoon is still on the loose, and the folks on Deckawoo Drive need Francine back. Can she face her fears, round up the raccoon, and return to the ranks of animal control? Join a cast of familiar characters -- Frank, Stella, Mrs. Watson, and Mercy the porcine wonder -- for some riotous raccoon wrangling on Deckawoo Drive.